The arena floor had been transformed into extra seating, with row after row of chairs flanking the stage’s sides. You’d better believe it was packed. It was a triple whammy of Texans country musicians. Legendary Lone Star State singer-songwriters and longtime friends Lyle Lovett and Robert Earl Keen primed the crowd for the royal treatment: a performance by the King of Country himself. That’s right. We got George Strait. It was an epic night. 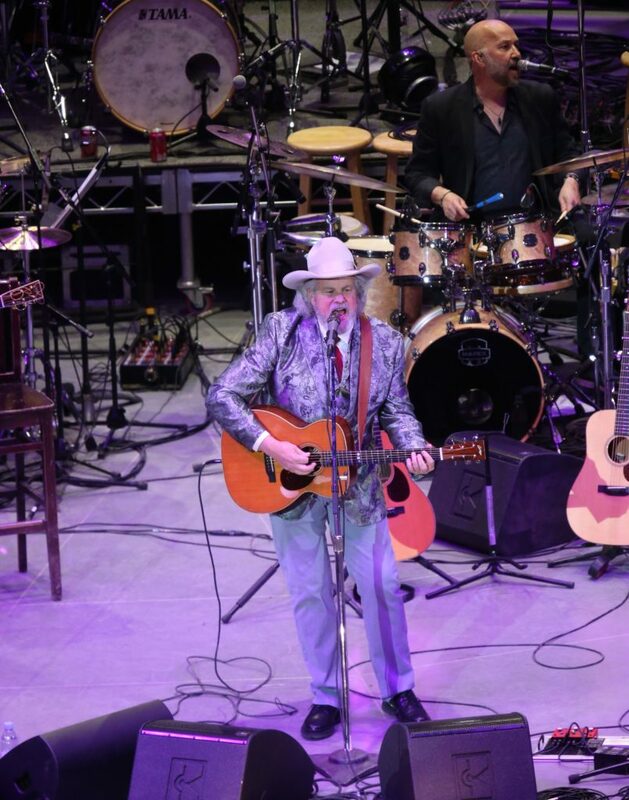 After a stunning performance by Lovett and Keen, taking turns in each of their signature styles before culminating in a delightful duet, the 66-year-old Strait put on a concert for two hours — plus a whopping 20-minute encore. The Houston Livestock Show & Rodeo didn’t reveal that “The Front Porch Song” crooners would be opening for Strait until last September. Fans couldn’t believe the get. And last night, they weren’t disappointed. It didn’t hurt that the duo are hardly Rodeo Houston first-timers. Keen wowed the crowds from 2000 to 2004, then again in 2006, and Lovett knocked it out of the park in 2001 and 2002. Friends since their college days at Texas A&M University, Lovett and Keen knew just how to play off each other’s energy, sharing the stage and building each other up. They went back and forth, playing five songs each, letting each other shine. It was a great combination. Lovett soulful and sort of solemn, Keen with an easy smile and a twinkle in his eye. As soon as the stage lit up, Lovett went full throttle with a lively rendition of “Cute as a Bug,” backed by an impressive band of keyboards, drums, vocals and many, many types of guitars. Everyone was looking sharp in suit and tie, even if Keen’s version was a brocade blue and silver blazer and jeans to Lovett’s classic outfit. And the crowd did love it, from Lovett’s “If I had a Boat,” dedicated to his cousin David, who was in attendance, to perhaps its polar opposite, Keen’s “Gringo Honeymoon,” a little less wistful, a little more whiskey. It’s no secret that Houston Rodeo fans love a good reference to their beloved state. Lovett delivered in a big way. Still, Lovett topped it with his performance of “Church,” bringing some spirituality to NRG with a gospel-style song that features some good ol’ country music cleverness. It starts off serious, with church starting right on time, but the preacher begins waxing poetic about judgment day while the congregation starts thinking more and more about their dinner. It was already almost 8 pm on a Sunday night, the last night of spring break, but everyone wanted to believe that the party truly would never end. Lovett joined in later, singing true and clear about days gone by in College Station. At the end, the two harmonized — even better than you’d expect. Their show wasn’t just an appetizer. It would have made for a satisfying main course almost any night at the Rodeo. We were just lucky we had the chance to overindulge, thanks to George Strait. If Lovett and Keen were the sausage on a stick, Strait was the turkey leg.